Command massive cosmic warships in this free-to-play game. An often spectacular space shooter that lacks the variety and depth to justify serious investment. Expect to pay Free-to-play/How deep is a black hole? My artillery cruiser lurks between some space station towers on the peripheries of the battlefield, directly facing the enemy flotilla to protect its elongated body from attacks. It’s taken a long time to maneuver myself into this position, but getting this kind of angle in this game of slow-moving behemoths is an invaluable advantage. I decimate enemy healing ships with powerful focused beams, I fusillade their dreadnought, and for a minute I’m single-handedly swinging the battle. Then an enemy X-Wing-like runt winds-and-warps its way up to me to end my spree. 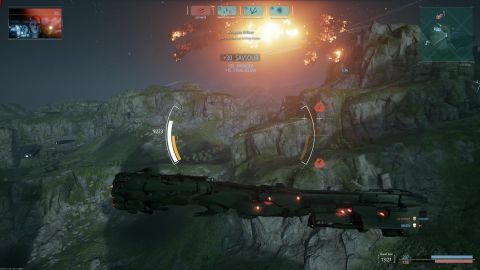 Despite playing out in real-time, Dreadnought can feel like a game of chess: its hulking vessels move so slowly that each move needs to be done with plenty of foresight. The 8v8 matches usually play out with the bulk of a team moving symbiotically together; a couple of healing ships flitting around heavyweight dreadnoughts and destroyers. Away from the core fleets however, zippy corvettes cat-and-mouse each other around, and maverick cruisers take potshots from the flanks. When the beams and the bombs are in full swing against some of the better map backdrops—planets curving across the bottom of the screen or industrial mega-stations floating in space—Dreadnought can look majestic. Its five maps are vast, pretty spaces dotted with gorges to duck into and structures to hide behind, and its three game modes—Team Deathmatch, Conquest and the MOBA-inspired Onslaught—all offer small but enjoyable twists on the goal of blasting the enemy team out of the skies. While movement is lumbering and befitting of the size of vessels you’re handling, combat is more immediate, requiring precise shooting between long reloads, and sparing deployment of energy-depleting shields and damage boosts, which are activated using a pop-up radial menu. Each ship has four abilities assigned to number buttons too, which you can switch up between, say, homing missiles and artillery bombardments, to more defensive moves like anti-missile systems and fast evasive maneuvers. These actions allow for a little spontaneity and fluidity amidst the wide berths and methodical movements of the fleets. The long cooldowns on these moves mean that you can just about execute each one once during a dogfight, and perfectly timing that downward dodge can be a very satisfying way to swing an encounter. It takes a fair while before progress in Dreadnought slows down to the point where you’ll be asking yourself whether to cough up those space credits or catch the next warpgate out of there. Or you can dig in and grind, of course. There are five tiers of ship, with battles divided into Recruit (Tier 1 and 2), Veteran (Tier 3 and 4) and Legendary (Tier 4 and 5) categories. Getting up to Tier 3 ships and Veteran battles takes several hours of play, but beyond that you’re looking at some serious time investments—all the more daunting given that Tier 3 ships seem significantly weaker that the Tier 4 ones you find yourself up against at the Veteran level. Not that this is too insidious as free-to-play models go, especially since higher-tier battles don’t offer that much of an improved experience except for the decreased likelihood of playing against bots. Once I hit heavy grind territory, I used the £60 Outlaw Hoard code to speed things up, giving me double XP for 180 days, a couple of hero ships that allowed me into the rarefied stratosphere of Legendary battles, enough GP to buy a snazzy new ship of my choice, some cosmetic bits, and a whole load of credits. The problem is that nothing really ratchets up in the upper echelons of the game. Higher-tier weapons are usually just bigger-number versions of earlier ones, and feel outmatched by the improved defensive abilities of higher-tier ships (those medics with their proximity-based healing lasers are the unsung heroes here). So instead of feeling more explosive and dynamic, higher-tier battles tend to feel slower and more frustrating. Playing ‘Legendary’ battles, the game doesn’t so much feel better as look better—with more bespokely customised ships on show, and a chance to admire some of those pay-only Hero ships. It feels like a superficially snazzier version of the lower levels, like travelling in premium economy. Dreadnought offers some unforgettable moments of cosmic warfare, and it’s refreshing to see a free-to-play developer bringing down some of its paywalls instead of building them up. But unless you have a penchant for pimping up some undeniably good-looking spaceships (complete with dynamically firing thrusters that glow red when you move the ship—phwoar), there’s little awaiting you at the higher tiers of the game that you can’t already find earlier on. That presentational lustre and early-game promise of tactical depth never quite take off into the next dimension.